Aesthetic Medicine Market size was valued at USD 9.2 billion in 2017 and is expected to witness more than 10% CAGR from 2018 to 2024. Developments in surgical as well as non-surgical aesthetic procedures will be the key factor that will drive the global aesthetic medicine market during the forecast period. Availability of advanced aesthetic devices that offer effective, time-saving and minimally invasive treatments will increase the adoption of such devices. Huge investments in R&D will lead to innovations in aesthetic medicines thereby augmenting the aesthetic medicine industry growth. For instance, Ideal Implants Inc. developed ideal implant, a structured breast implant that combines benefits of saline implants and silicone implants. Non-surgical procedures segment accounted for USD 6.6 billion in 2017 and will continue to grow during the analysis period. The growth is attributable to growing inclination of people towards non-invasive aesthetic procedures. According to American Society for Aesthetic Plastic Surgery, the number non-surgical aesthetic procedures performed in 2016 was 11.7 million in 2016 as compared to 10.9 million in 2015. Developments in technology such as non-invasive visible fat reduction and laser based vaginal rejuvenation will augment the demand for such procedures. Moreover, availability of well-developed healthcare facilities coupled with increasing healthcare expenditure will flourish the aesthetic medicine market growth over the forecast timeframe. Surgical procedures segment is estimated to show 10.2% CAGR during the analysis period owing to increasing adoption of facial surgeries such as eyelid surgery, nose surgery, neck lift and facelift across the globe. Increasing prevalence of obesity will upsurge the need for fat reduction surgeries such as liposuction, labiaplasty and surgeries of other body extremities. Moreover, awareness among people regarding aesthetic procedures coupled with increasing affordability and advanced healthcare infrastructure will stimulate the segmental growth in the coming years. Facial aesthetics segment dominated the global aesthetic medicine market with USD 4.1 billion in 2017. Increasing signs of facial ageing among women aged 40 years and above will foster the need for surgical as well as non-surgical facial aesthetic procedures. Demand for eyelid surgery, nose surgery and other facial procedures is increasing in recent years. According to the Westlake Dermatology & Cosmetic Surgery, in 2016, over 31,000 rhinoplasty procedures and nearly 90,000 blepharoplasty procedures were performed in women between 15-55 years of age. Increasing adoption of such procedures will boost the industry growth during the forthcoming years. Breast aesthetics segment accounted for 12.7% revenue share in 2017 and is expected to show lucrative CAGR during the analysis period. The growth is attributable to factors such as increasing prevalence of breast cancer and growing demand for surgical procedure. As per the Westlake Dermatology & Cosmetic Surgery, number of breast augmentation procedures performed in the age group between 20-29 years accounted for 82,000 in 2016. Growing concerns among youth regarding appearance of the breast, especially after pregnancy or considerable weight fluctuations will further augment the demand for such procedures and spur the aesthetic medicine market size. Females segment accounted for the highest market share of 80.2% in 2017 and will continue to dominate over the analysis period owing to growing urge among women to look young and beautiful. According to the Cosmetic Surgery National Data Bank Statistics of American Society for Aesthetic Plastic Surgery, women accounted for 92.4% skin rejuvenation procedures in 2016. Moreover, increasing adoption of breast augmentation procedures in females between 19-34 years of age will foster the demand for breast aesthetics. Growing demand for various facial procedures among the youth will spur the aesthetic medicine industry growth over the analysis period. Males segment is expected to show considerable CAGR of 11.6% over the forecast period. Demand for non-surgical procedures such as derma fillers, botulinum toxin injection and other facial aesthetics is increasing rapidly among men in the recent years. Developments in technology such as ultherapy to lift, tone and tighten loosen skin on bow, neck and under the chin, cool sculpting for fat reduction and other such advanced technologies will boost the adoption of aesthetic procedures among men. Untapped male patient population will serve as an area for growth thereby driving the segmental growth. Hospitals segment accounted for USD 3.1 billion in 2017 and is estimated to show robust growth during the analysis timeframe. Affordability of hospitals to purchase high-cost instruments, availability of trained healthcare professionals in hospitals for operating large devices as well as well-developed healthcare infrastructure will lead to increased number of hospital procedures. Furthermore, increasing patient affordability due to growing disposable income will upsurge the segmental growth throughout the forecast period. Ambulatory surgical centers segment is expected to witness 11.1% CAGR over the forecast period owing to increasing preference of people towards minimally invasive procedures performed at the ambulatory centers. Benefits offered by these centers such as short stay, cost-effective procedures as well as adoption of less invasive procedures will fuel the segmental growth. Growing inclination of patients towards day surgeries in order to minimize hospital expenses will augment ambulatory surgical centres segment growth over the forecast period. North America aesthetic medicine market dominated the global industry with USD 3.9 billion in 2017 and is estimated to witness lucrative growth during the analysis period. Growing awareness regarding importance of aesthetic appearance, availability of technologically advanced procedures and growing inclination of people towards less invasive procedures are the key factors that will boost the regional growth. Furthermore, sedentary lifestyle, smoking and alcohol consumption as well as other environmental factors leading to obesity will accelerate the demand for body contouring procedures. Presence of major industry players in the region as well as huge investment in R&D leading to technological advancement will further accelerate the regional growth. 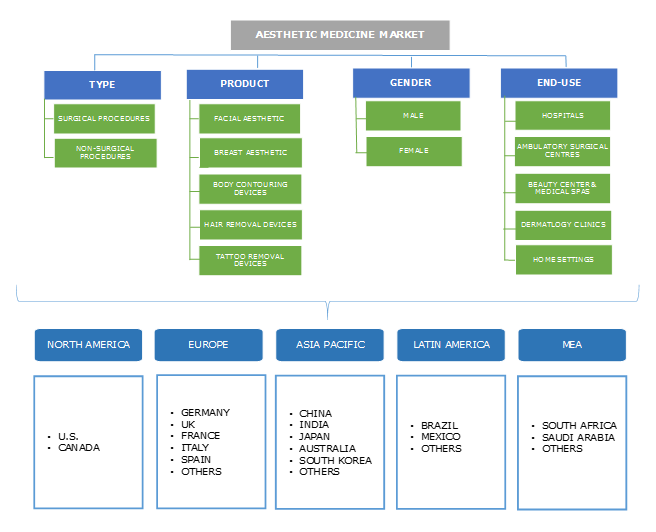 Asia Pacific aesthetic medicine market is estimated to show robust CAGR of 12.5% during the forecast period due to increasing elderly population base and rising prevalence of obesity and cancer across the region. Increasing demand for breast augmentation procedures in developing economies such as India and China will flourish the Asia Pacific aesthetic medicine market growth. Moreover, development in healthcare infrastructure, increasing healthcare spending and growing awareness among people will drive the regional growth during the analysis timeframe. Some of the key players operating in global aesthetic medicine market include Allergan, Alma Laser, Cynosure, Galderma, Lumenis, Johnson& Johnson, Merz Aesthetics, PhotoMedex, Syneron Medical, Valeant International and Zeltiq Aesthetics. Key strategies adopted by most of the key industry players include new product launch, acquisitions, mergers and partnerships to strengthen product portfolio and maintain their market position. For instance, in August 2016, Merz acquired On Light Sciences, an aesthetics medical company developing technologies to improve laser-based dermatologic procedures, with an aim to strengthen company’s product portfolio. Aesthetic medicine industry is relatively new as compared to the traditional plastic surgery industry. The industry is booming in recent years and is poised to show considerable growth during the forecast years. Aesthetic medicine industry is highly fragmented with presence of many global and local players across the globe. However, companies are majorly focusing on acquisitions, mergers and collaborations to diversify product portfolio as well as widen the company’s customer base. For instance, Valeant International Inc., acquired various local players such as Obagi, Solta Medical, Medicis and PreCision Medical by 2014. Moreover, increasing investment in R&D by industry players will result in development of novel products. With introduction of new products, the aesthetic medicine industry will witness robust growth in coming years.